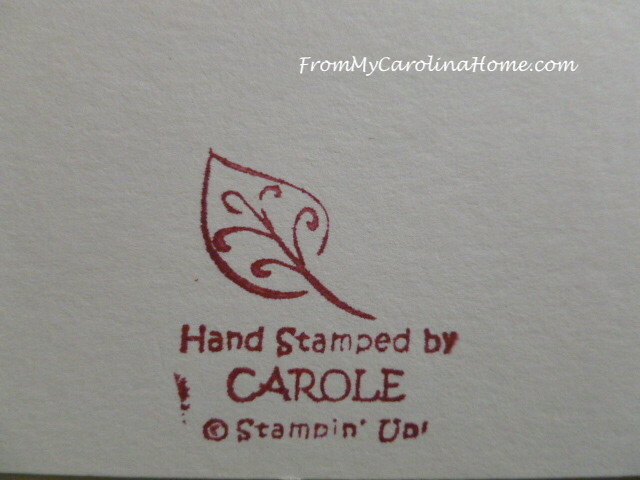 I still have a huge stash of stamping supplies, and was looking for another way to use some of it. 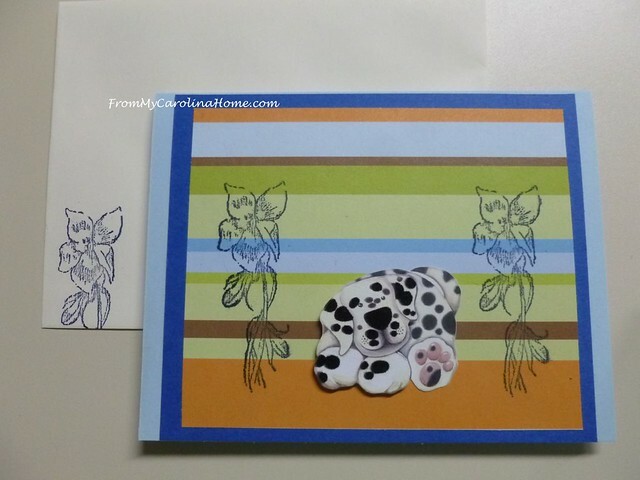 When I received the gift of two boxes of papers, I found a number of dog and cat related papers, plus little chipboard and cardboard cutouts, and some other charms and such with animal themes. Last week we got a postcard from the Blue Ridge Humane Society about their fall fundraiser that will include a Silent Auction. So I emailed the director and asked if she would like to have some handmade cards. 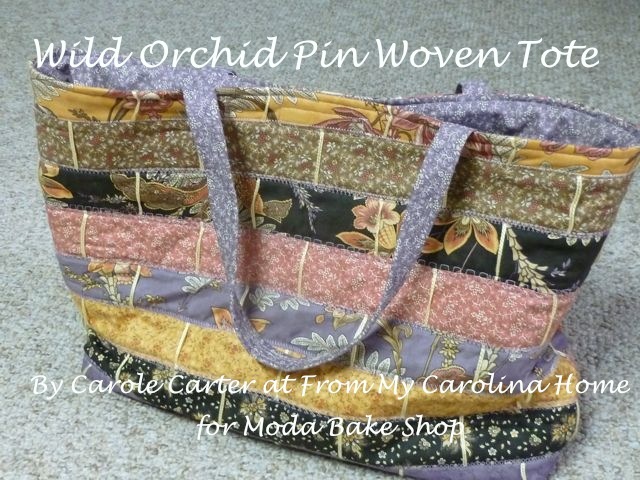 I stole this idea from my friend Gail who does a basket of handmade cards for our car club Silent Auction every year. The director said yes, so I went to the work bench inspired to make some cards for lots of occasions. Isn’t this doggie cute? 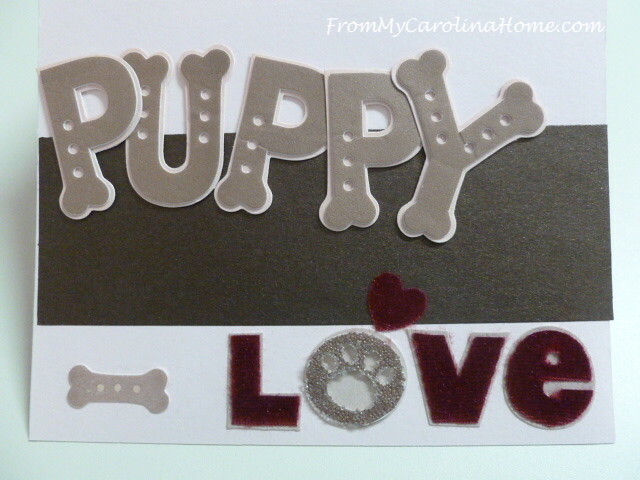 This one was puffy letters already spelling out Puppy Love. The hearts and bones were in the same package. I placed it on a textured bar of dark brown. Inside the cards are all different too, this one could mean anything, LOL! The backs all have my special stamp. 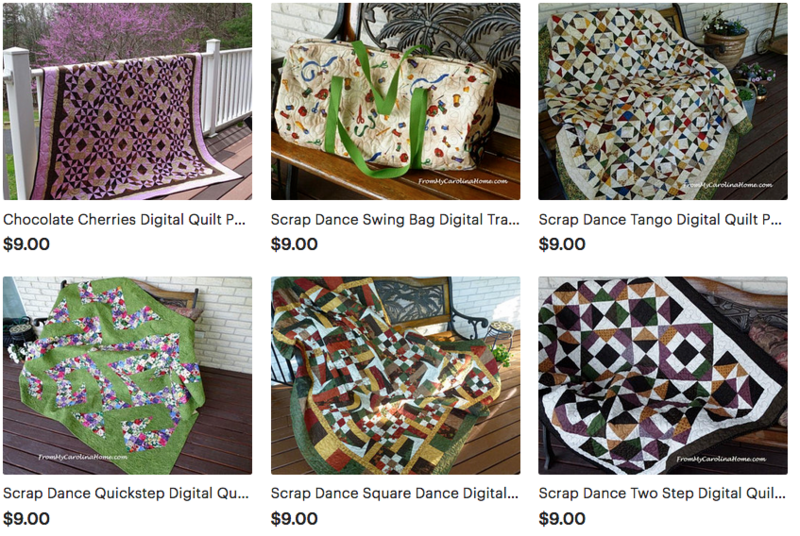 I made so many that I am just going to show you the finished projects this time. Here I set a sticker on a dark blue frame and glued that to the card where I had stamped paw prints. Another sticker placed on blue cardstock then framed on dark red, with a paw print paper underneath. I stamped the sentiment “It’s Tough Being Perfect” on the lower right. 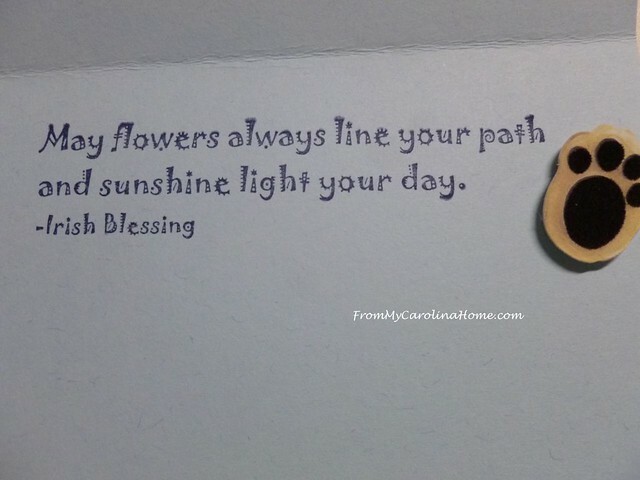 Inside, a stamp that could go for birthdays, thank you, or inspiration. This dalmatian has such cute feet with his toes showing. I put him on a striped background and added a flower path for him. That went nicely with this stamp inside. The little skunk has a flower to present. I put a strip of textured paper underneath as a ground. Did you notice I’ve decorated envelopes to coordinate? 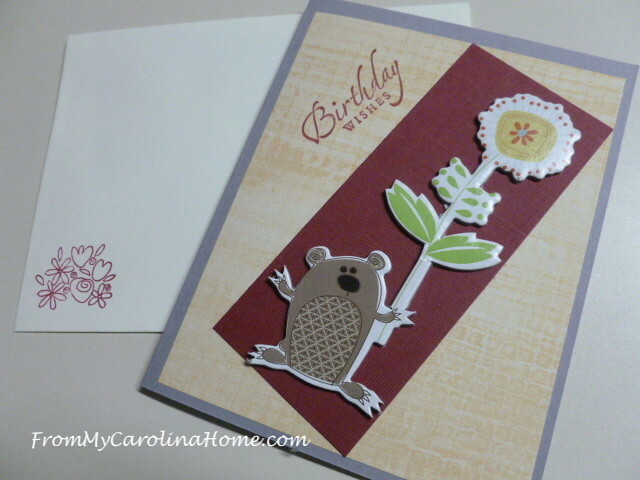 I think this little chipboard guy may be a beaver. 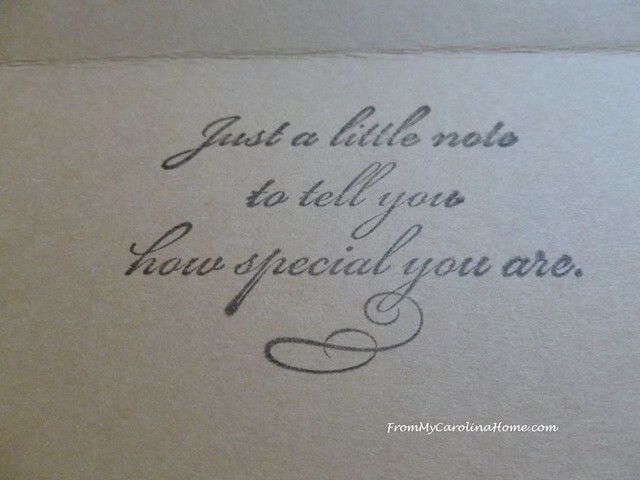 He brings Birthday Wishes stamped onto patterned watercolor paper. 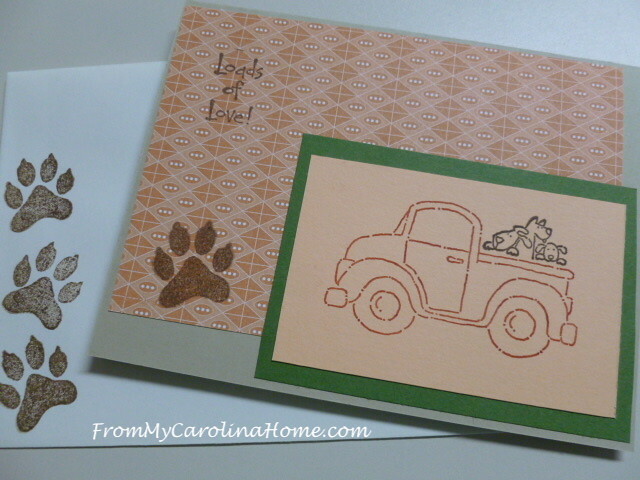 Loads of Love is a stamp set with a truck and a bunch of little things to add to the truck bed. This time it is dogs. 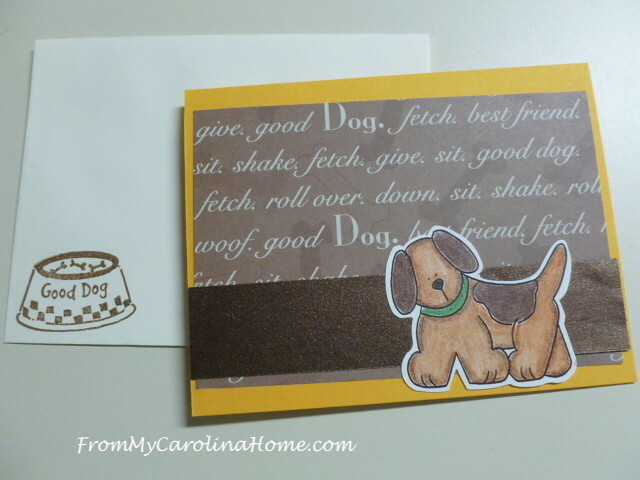 The sentiment “Loads of Love” is stamped on the patterned paper, with a paw print. 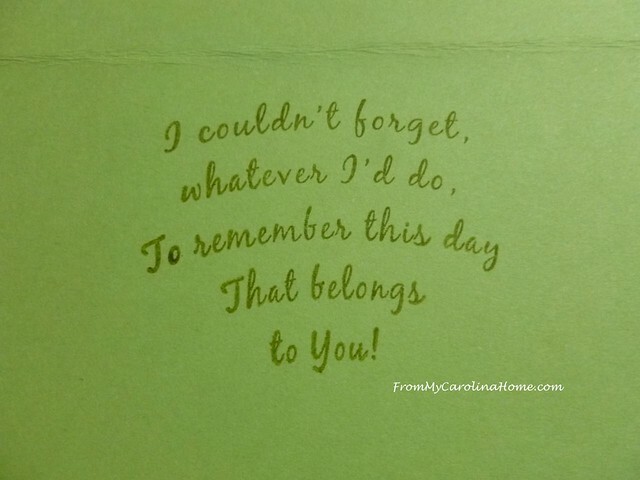 The sentiment inside is so cute, also from the same set, and I added some bones to this one. 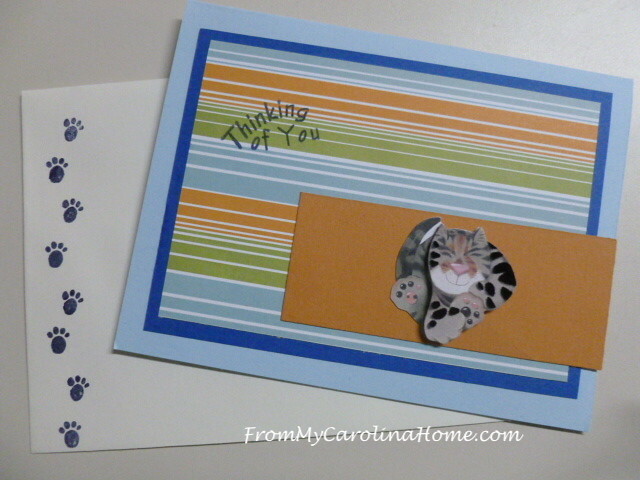 More stripes on a Thinking of You card with a cute kitty with cute kitty toes. I just kept going, having a delightful day of creating cards. 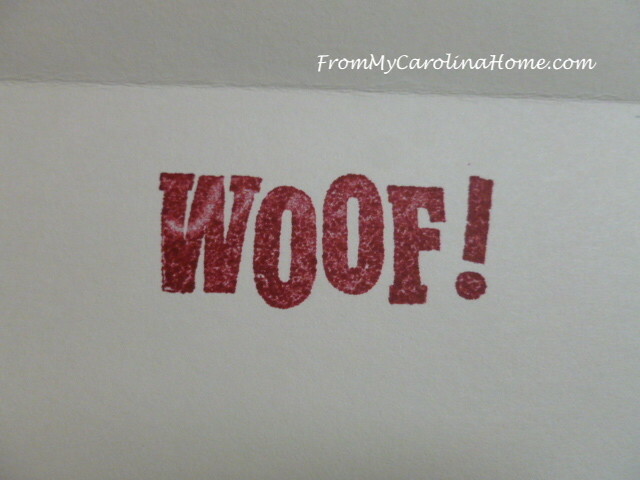 The kitty card above has this stamp on the inside. The two on the right have more cute patterned papers. 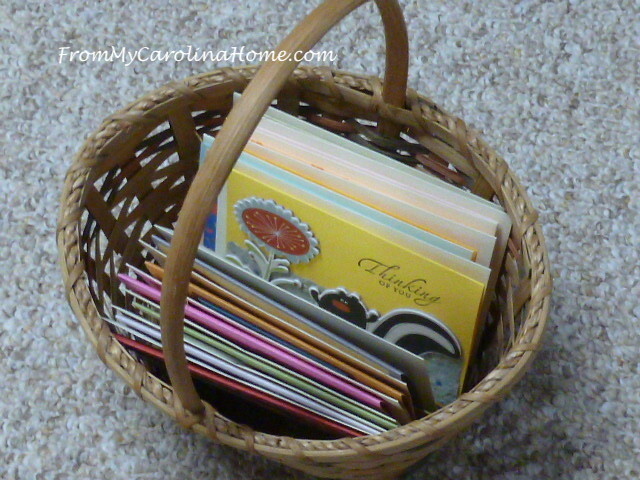 So far I have 15 cards done, and a little basket to put them in. 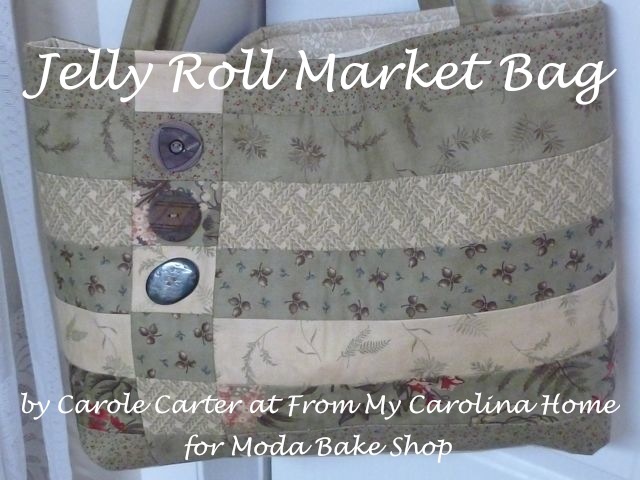 I’ll add some tissue paper and one of my blog cards for the auction. I’ll probably make a few more before the deadline which is mid-September. I needed to get a good start now, as that is my really busy time with the fair and the library annual sale. More on those later. So I have a good basket of cards, and several challenges met – Just For Fun Stripes Challenge, Ellibelle’s Feature a Creature, and Crafty Hazelnut’s Pattern Paper Challenge. So I’ll be linking up with those parties this week. 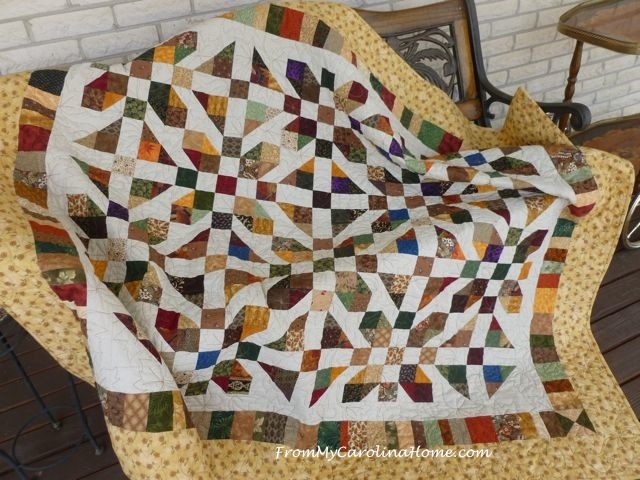 More inspiration for us stampers! What do you think is a good number of cards for a Silent Auction prize? 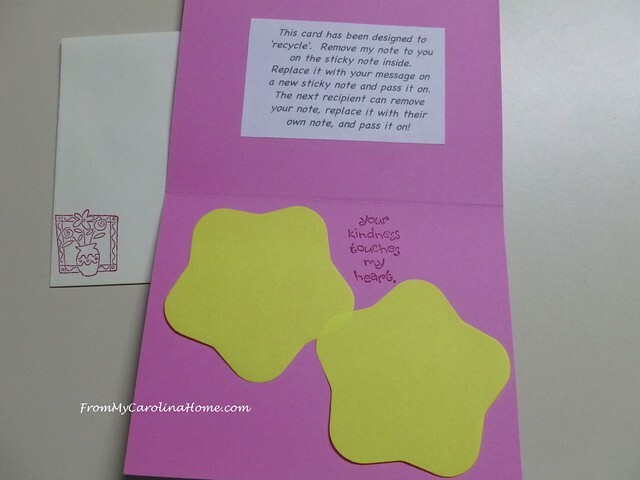 Those cards are adorable Carole! Bless you for making so many for a good cause! Earlier this year I gave all my stamps, papers, and other supplies to my niece for her scrapbooking projects so I don’t do handmade cards now. It looks like you had a lot of fun! I have never made my own cards, but yours are adorable. I have a ton of scrap-booking supplies for my photos, but I have really let that fall to the wayside for other pursuits. I struggled with creativity in that area. I think you may have inspired me to get back to it. Carole these are Beautiful Cards!!!! Love your choices, I am sure it will be well received. Very cute! 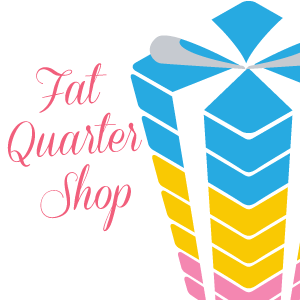 Your cards are adorable and are for such a worthy cause!!!! In the 30 years that my husband and I have been married, we have had seven beloved cats; all were either strays or from the local animal shelters. So happy you support them! Carole, these cards are adorable. They must have been really fun to make. 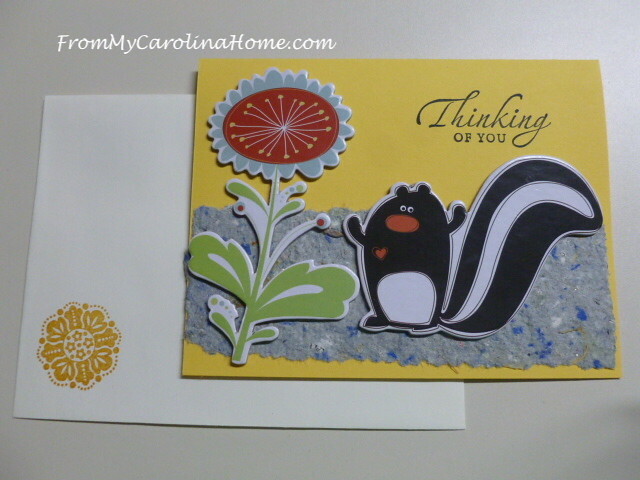 Cards are so sweet, and really treasures for some people that get them in the mail. These are great cards for a great cause. 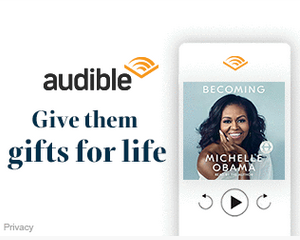 It sounds like you may have inspired some others to give this a try. Giving is such a rewarding thing for the giver as well as the recipient. Question: I am working on my Christmas card donations at present and wonder if you will need any cards for Safelight this year? What a talented, inspiring person you are! Thank you. 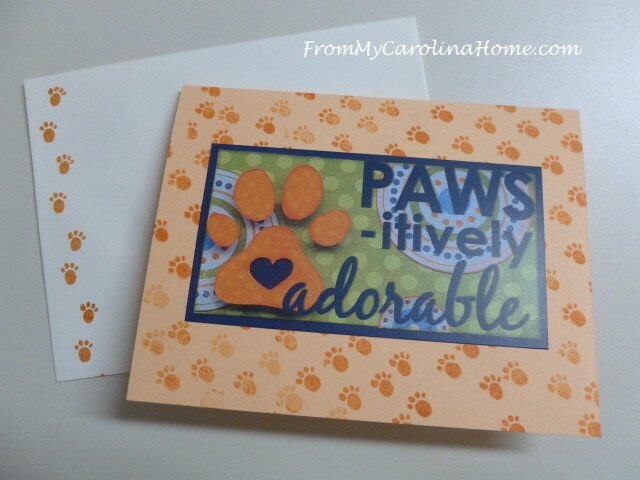 Oh, yes, that is a very good idea to make pet related cards for the auction! 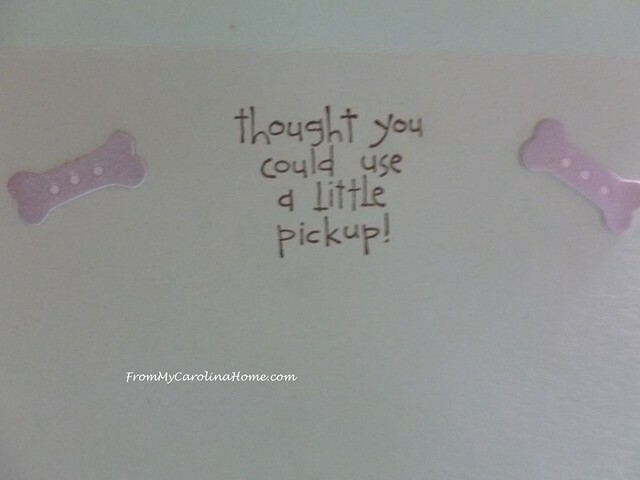 I like all the cards, especially that one with the little pick up sentiment! That is a winner! Thanks for sharing these with the JFF challenge too! Awesome support for the Humane Society! These cards are all cute and well done. Inspiring! If you do sets of 6, that should get anyone started on card sending, plus you can have more prizes!! What adorable cards! I especially like the one with the skunk. Those are really fun cards, and I bet they do well at the fundraiser! How cute and a lovely idea. 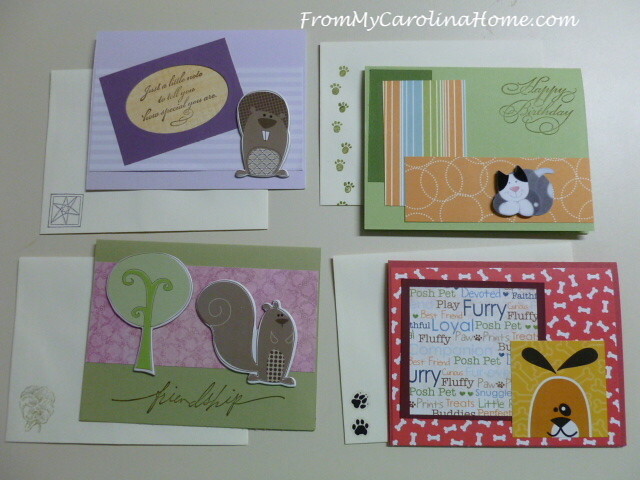 Your collection of cute cards and decorative envelopes is such a nice gift for the silent auction! I love the pet themes and it’s such a worthy cause to donate to! Keep up all the great work – I’m sure your contributions mean so much to so many! Well done. What a great collection of cards. Great way to help out a fund raiser. 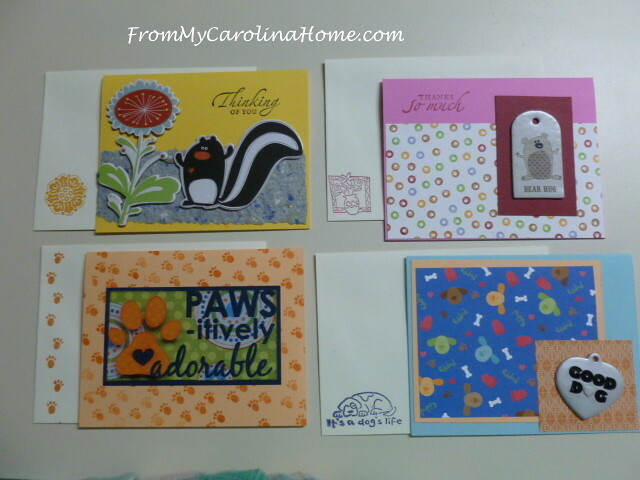 Looks like you had a fabulous and very creative day making cards, each one so fun and loving all the critters! 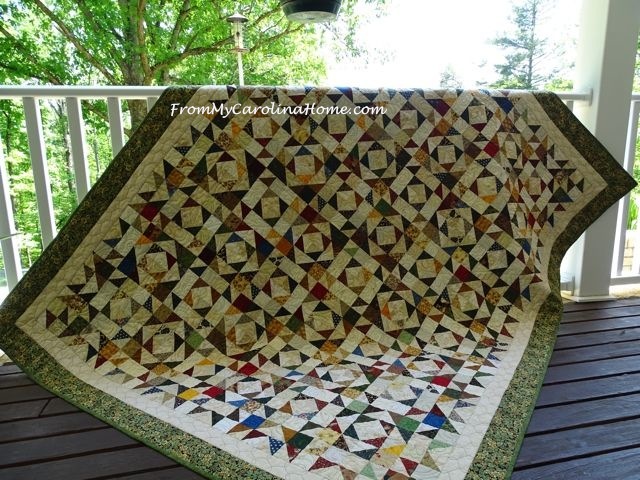 Thanks so much for sharing this month at Ellibelle’s Crafty Wednesday challenge! These are so cute! Great idea to put these in the auction. 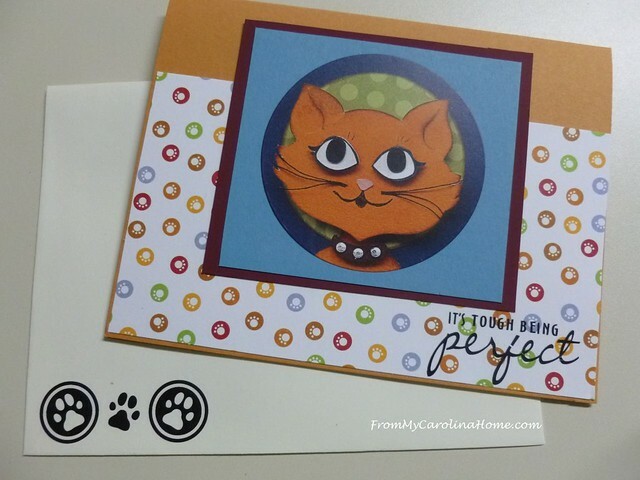 Thanks for sharing with Just For Fun stamps! I think you already have a good number of cards for the silent auction basket! Those are each cuter than the one before. I bet you DID have great fun making them.